ww2dbaseKatiou Meynier was the daughter of an influential politician related to the royal family of Annam and an European mother. She was often referred to as a princess in western parlance. She married French submarine commander Robert Meynier, a supporter of Free French General Henri Giraud, thus she would be referred to simply as Madame Meynier in some circles. She was arrested in German-occupied Germany, but she was able to escape imprisonment with the assistance of British Special Operations Executive (SOE) agents and French resistance fighters, some of whom were killed during the rescue operation. Returning to Japanese-occupied French Indochina, she maintained a network of lighthouse keepers, customs agents, harbor masters, fishermen, etc. to watch the Japanese. 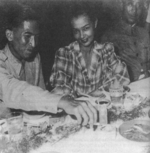 "The Madame was a natural for reaching the native residents", said the chief of Sino-American Special Technical Cooperative Organization (SACO), US Navy Commander Milton Miles, who was among those who received intelligence from her. In Jan 1945, a lighthouse keeper in her employment reported the arrival of a Japanese convoy about 26 ships in size in Cam Ranh Bay, and she reported this to SACO. Acting on this information, on 12 Jan 1945 US Navy Task Force 38 launched a large-scale carrier attack that found no convoy in Cam Ranh Bay but sank 44 ships in the surrounding waters, including 12 Japanese Navy vessels. Her network repeated such performance several times during the war. Meanwhile, her husband Meynier also ran resistance cells in French Indochina. Political in-fighting between Free French leaders Henri Giraud and Charles de Gaulle slowly turned in de Gaulle's favor, which gradually made Giraud's intelligence network, thus the Meyniers, irrelevant, as de Gaulle had his own intelligence network in China, the French Military Mission, under the command of Ambassador and General Zivony Peshkov. Additionally, many in the French leaderships held grudges against Katiou Meynier for costing the lives of several agents during her escape. Finally, some also feared that the anti-colonialist Franklin Roosevelt might support her, a proponent of an independent Vietnam, as a new monarch of post-war Indochina, which would endanger the French hold of the region. Growing sick of politics and unable to improve the situation, the Meyniers held bitter-sweet emotions when they were recalled back to France per orders to de Gaulle in the summer of 1944.